The day is here! Alvin Vandever’s commissioned art is done, and shipped to it’s new home back east. 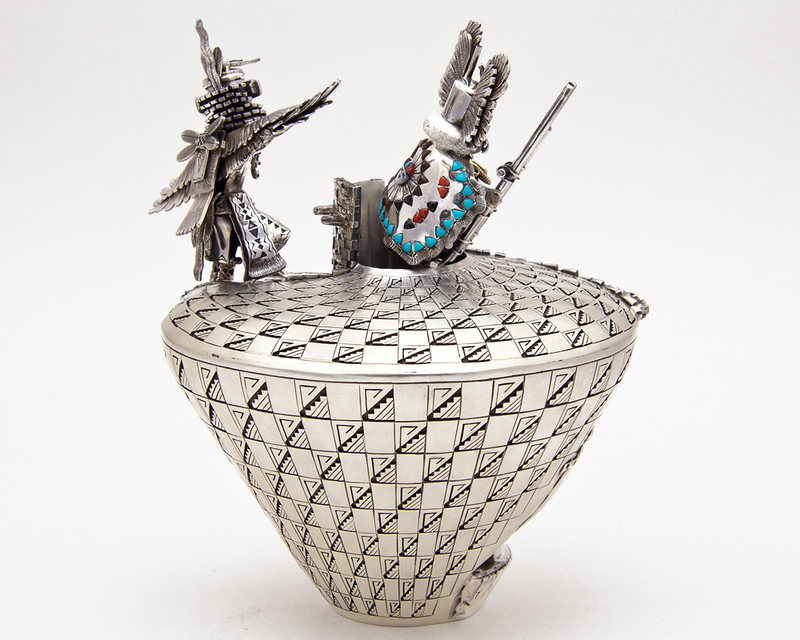 This particular piece was commissioned when a client saw Alvin’s last award-winning silver pot at a show last year. 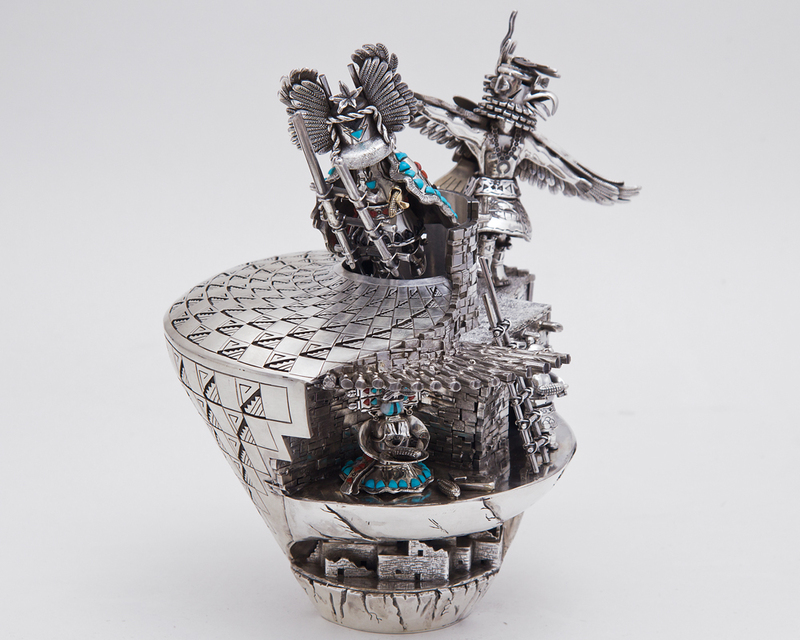 Work began in late 2013, with Alvin sketching ideas and concepts, and collecting the silver needed to make the piece. 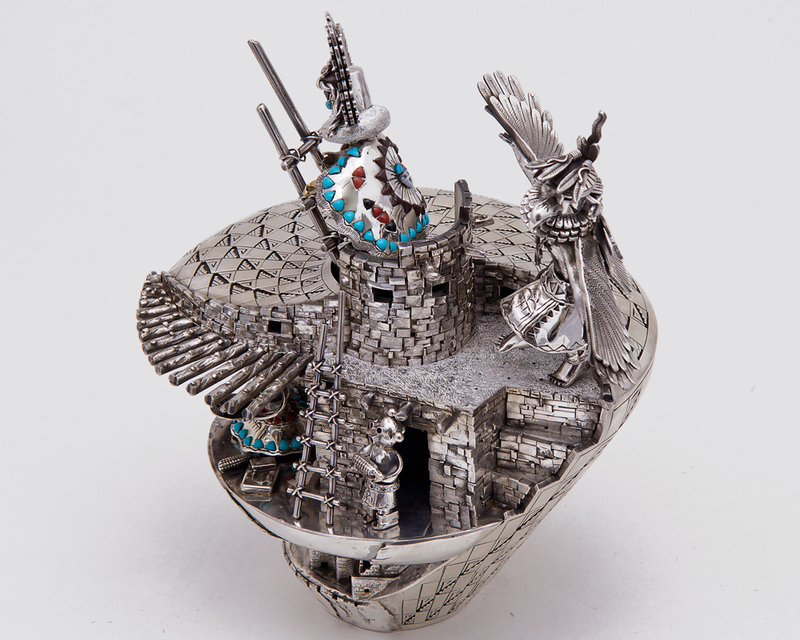 By February 2014 the silver was taking shape–though it may not have been a shape that was recognizable. 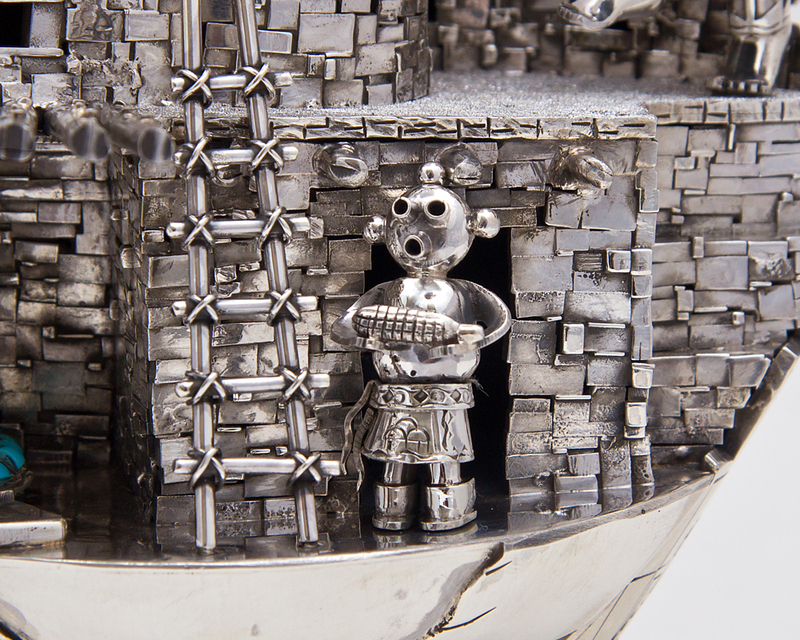 By the beginning of June the 3-plus pounds of silver had been cut, soldered, filed, stamped, and crafted into a one-of-a-kind work of art. We’ve got more media from this product to release in the future, but for now we’re thrilled to bring you these shots of the pot in our photo studio. 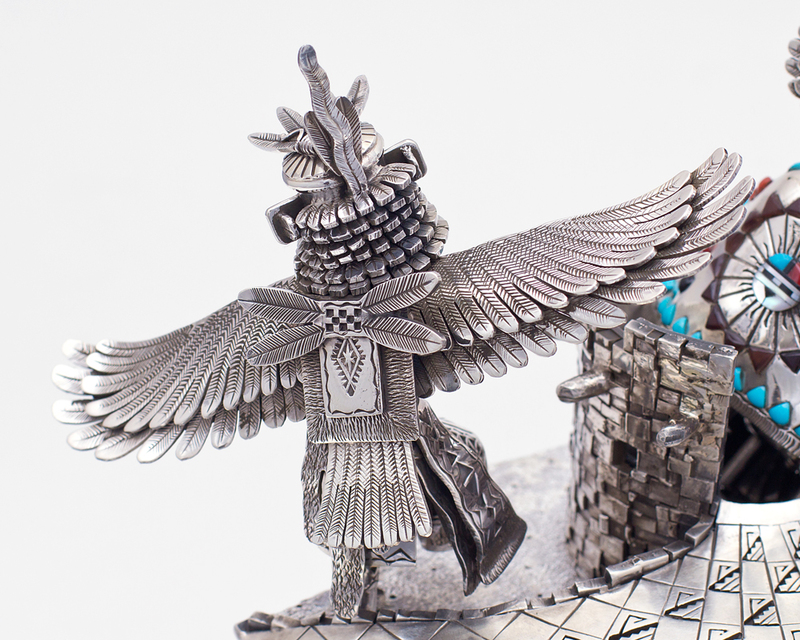 Alvin’s work is a joy to behold, and every detail holds interest and a significance. Acoma jet, coral, turquoise, mother-of-pearl, and sterling silver with a touch of 14K gold make this piece not only stunning, but also colorfully accented. This is Alvin’s most detailed, most involved project to date, but it accurately depicts what we’ve always said: if you can dream it, we can build it. 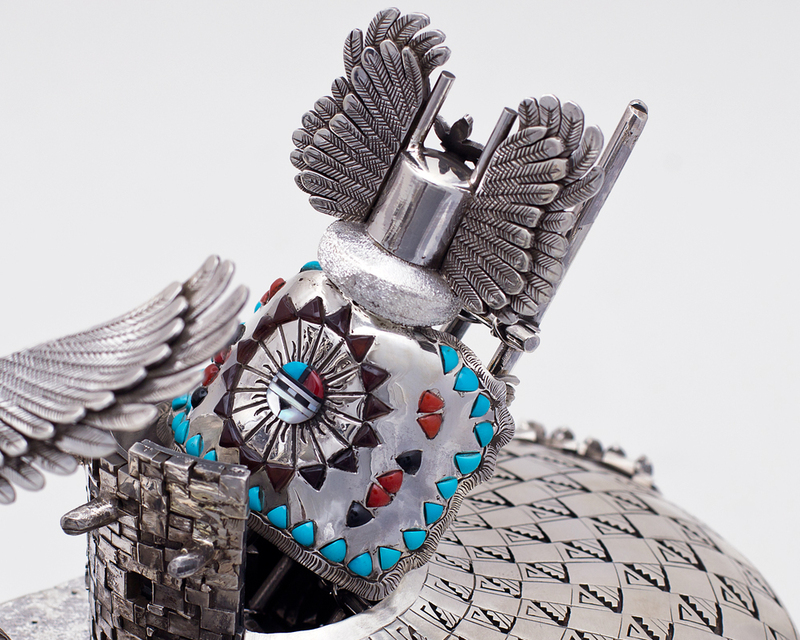 Even the smallest details, like the squash blossom necklace on the Eagle Kachina, and the 14K gold corn piece on the Crow Mother have been crafted in with a level of workmanship that is unparalleled. This piece will not be making the show circuit, but in the hearts of those who own it, have crafted it, and beheld it, it is a winner of the highest pedigree. 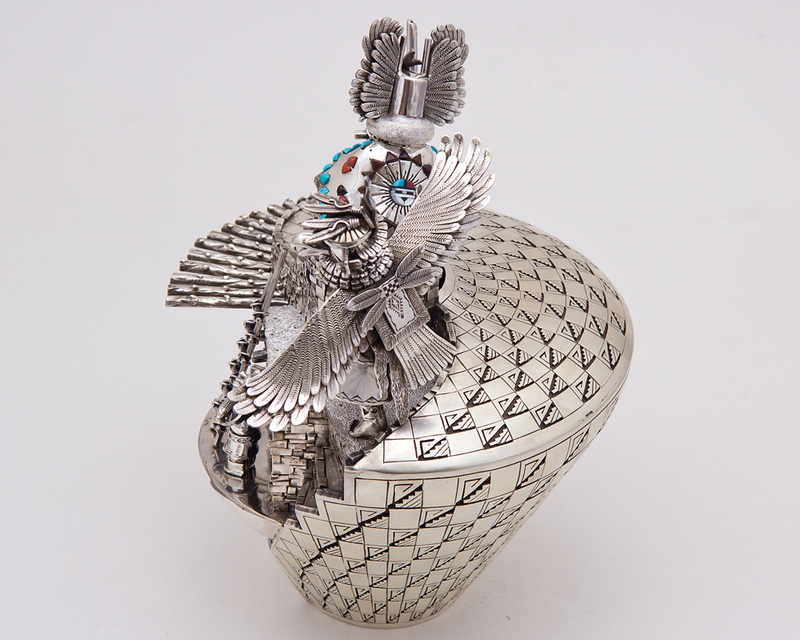 If you have a dream you want to see realized in silver, or gold, contact us! We really enjoy working with customers to bring their dream piece to life. Enjoy the photos, and as always click on each photo to see the large version! 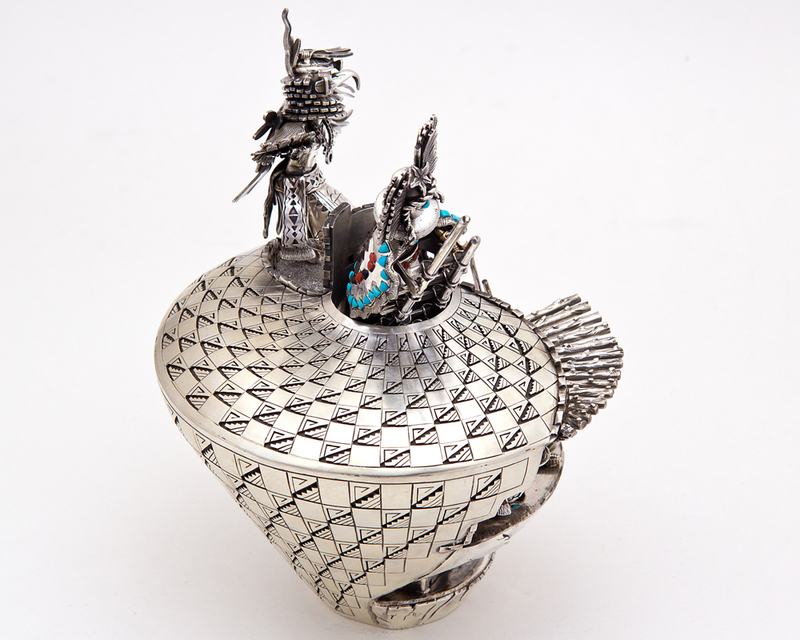 The side view, offering a better look at the Butterfly Maiden and the Crow Mother. The beautifully figured back and top of the piece. 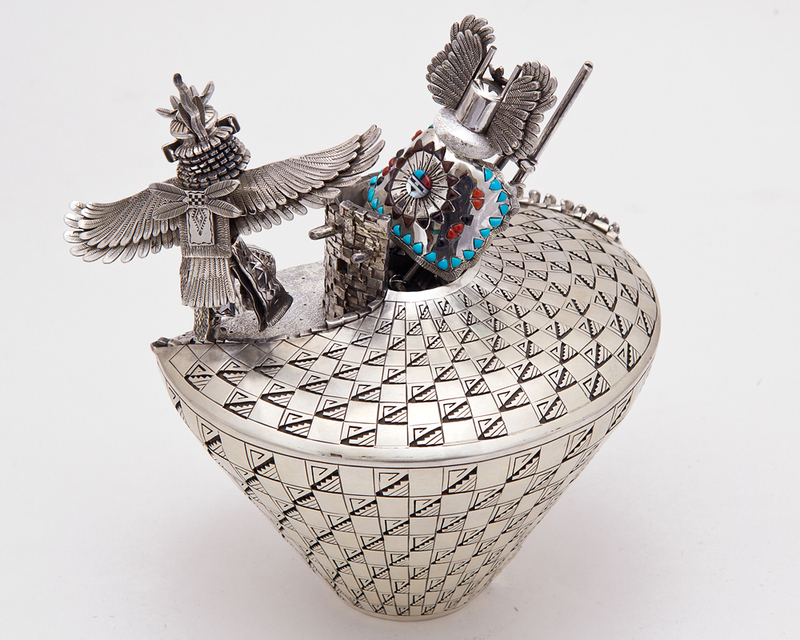 The back of the Crow Mother and Eagle Kachina figures are rich with detail. 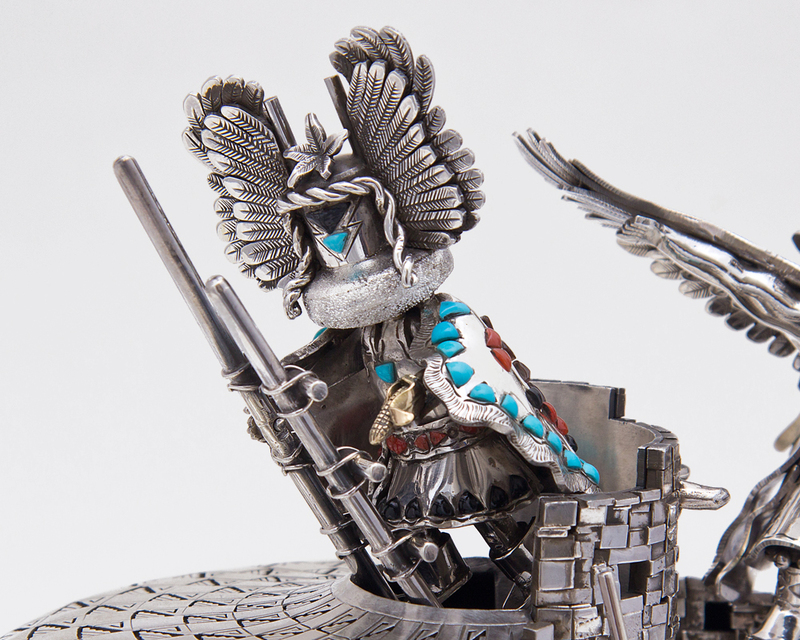 A better view of the back of the Eagle Kachina. An offset view shows the center area and the Mudhead figure. The Butterfly Maiden figure in the sculpture. 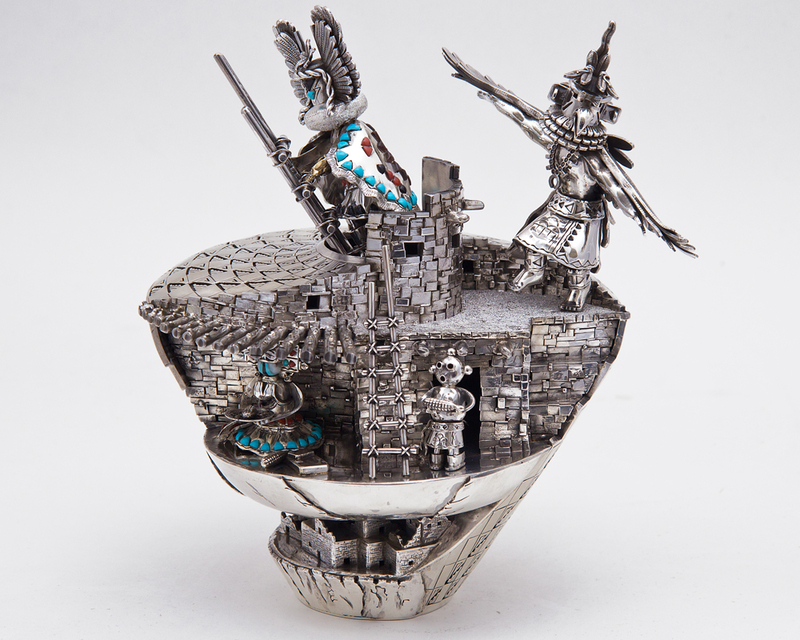 The Crow Mother Kachina on top of the piece. Note the 14k gold corn piece. 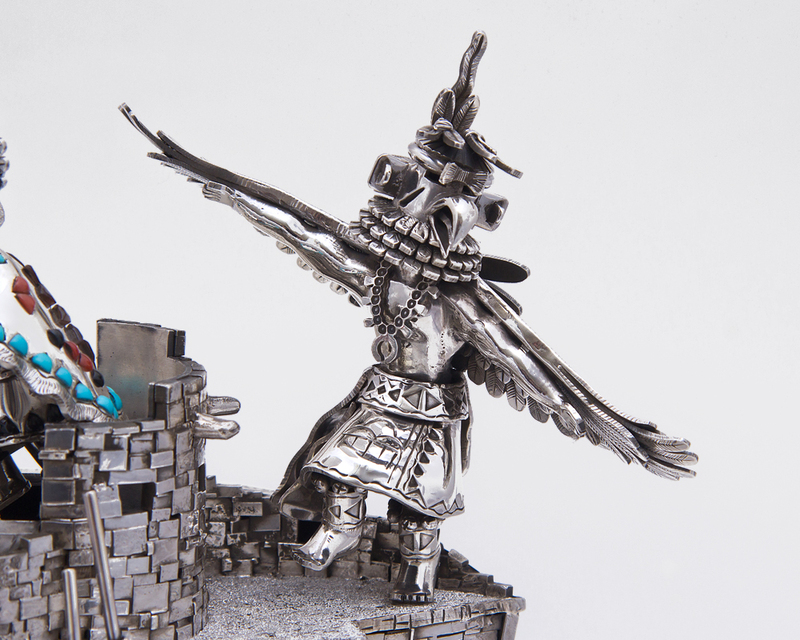 The Eagle Kachina in takeoff. Note the squash blossom necklace. Another view of the back. Alvin planned the smooth continuous lines from the earliest days of the planning. 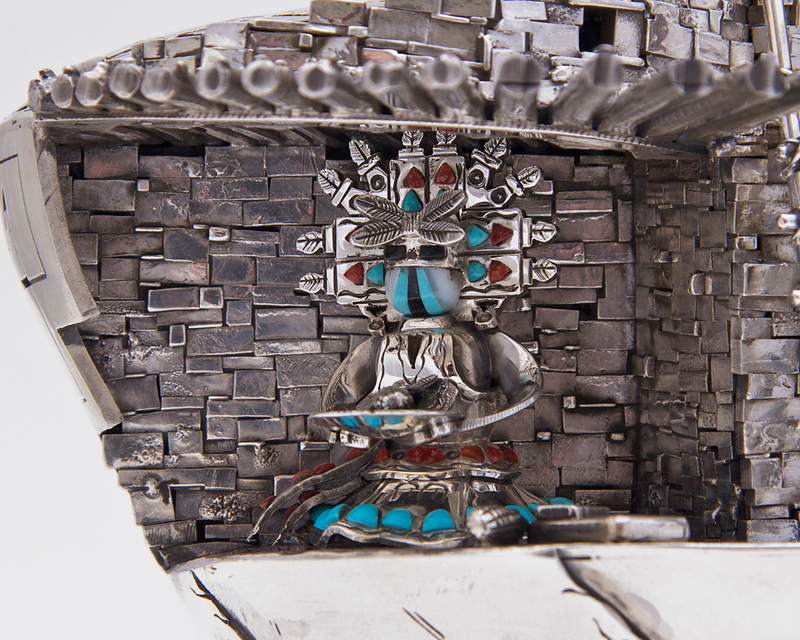 Even the back of the Eagle Kachina has been carefully thought out. 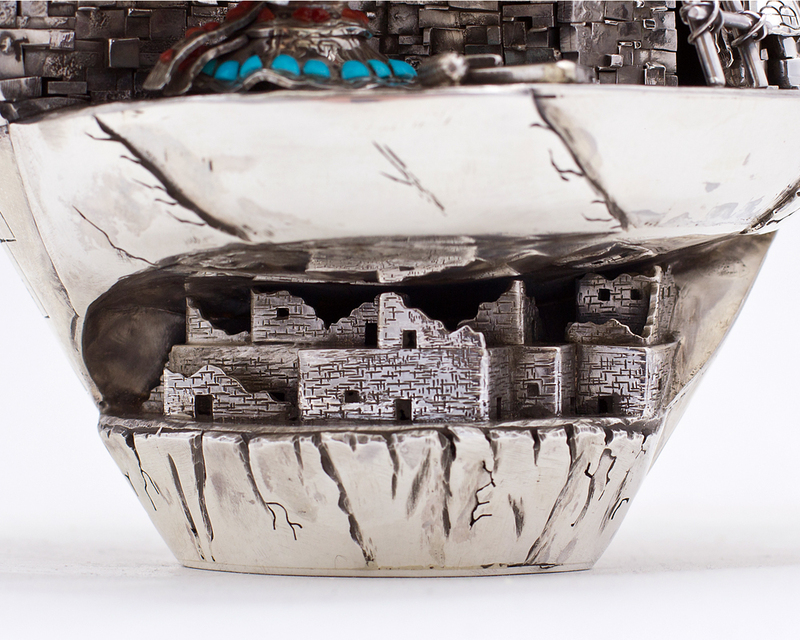 The small pueblo at the base of the pot was actually crafted first! That is stunning. Would love to havent one of those in my collection.